The anime series Kokoro Connect is one of that is most definitely full of surprises. Initially based on very little information and scarce examples of art, I assumed the series would strictly be a romance with dramatic fragments but Kokoro Connect swiftly puts that theory to rest by involving an otherworldly transition – but before detailing that, let’s begin with the basics. At the Yamaboshi Academy, five young students that have a history of feeling disconnected link up and form the Student Cultural Society (StuCS – but I prefer the lengthy label.) The characters that make up this ‘StuCS’ group are Taichi Yaegashi, Iori Nagase, Himeko Inaba, Yui Kiriyama and Yoshifumi Aoki, each with their own distinct quirk to fairly balance out the well sized ensemble in Kokoro Connect. 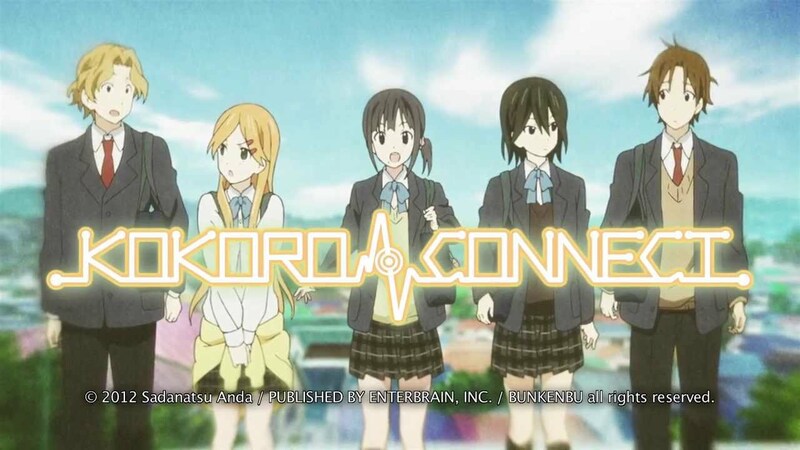 Now even though you may be thinking this isn’t anything out of the norm, what sets Kokoro Connect apart from other club/dramedy animes would be the fact that these five soon become subject to a supernatural element that forces the teens to body swap. In the beginning, it seemed as if it were only two, but the series begins to introduce each of them in new ways by swapping bodies and having their feelings and emotions on display for the opposite person. Sure, having a boy/girl switch bodies does indicate their will be some obvious and expected humor (the bathroom bit is something any anime would act on) but it has so much more that it wants to progress through aside from the typical wackiness that ensues in animes of a similar vein. Kokoro Connect tries its very best to pull from an emotionally rich place with the struggles of not only youth, but love and friendship. Even early into the series, two characters with a connection swap and it becomes a momentary comic relief, but a history of abuse gives everyone else (viewers included) a glimpse at what exists beyond the surface of things for these five. Trust becomes a part of this, with one’s innermost secrets and feelings being able to be accessed or left private, testing the waters of friendship. There isn’t an exact answer to the mystery behind the events in the first place, but it is certainly an evaluation of humanity, bonds, and the way people would handle taking on information that isn’t something we’re supposed to be privy to. As mentioned, the plot and depth of the series truest concept sets up many opportunities for praise and narrative, but it still finds the time to showcase budding romances. This unwanted closeness tends to ignite a spark in multiple of the five that they already had (just needing a push) setting the table for an extensive melodrama to find its way in the narrative of Kokoro Connect. This aspect of the anime series can be helpful and problematic, by telling a story about love (fulfilled and unrequited) yet the four OVA’s that act as a sequel take more time to deal with than I would have assumed after understanding the bases Kokoro Connect tried to cover. I wouldn’t describe the romantic developments in Kokoro Connect as a bad thing, it just takes appreciating the transitional direction to appreciate the full scope of the series with a lot going for it. By acknowledging real-life anxieties as well as confronting the scope of a healthy or damaging relationship, the maturity in Kokoro Connect proves that genre boundaries aren’t always so black and white. Animation quality is something Kokoro Connect has down. The characters do have their own small unique traits and artistic separation, but the art uses an entire scene to recreate an emotion behind a character’s mood which is easily one of the major pros to Kokoro Connect. The opening and ending themes contain colorful art that is enjoyable on a recurring basis and the songs add a sense of lighthearted happiness and hope that fit the struggles the five feel in the 17 episodes (if you count the OVA’s with 13 episodes.) There is a background song that plays during the more serious parts of the series and upon every play, I found myself understanding why it was a critical choice to produce a well-planned ambiance with art, music, plot and characters. The English dub was a great choice on Sentai Filmworks considering they are selective and overall, Kokoro Connect had great ambition with only some minor stumbles along the way. – Yui confronting her androphobia was a brilliant anime plotline that signified something usually unheard of in anime. – The ending between Taichi and Iori wasn’t expected, but was a bittersweet wrap-up before giving an idea of the future for them. – I didn’t expect the series to be so philosophical in moments – even with a few select issues, Kokoro Connect was a needed change of pace for genres and its unpredictability was appreciated.